While growing up, I recall my parents, grandparents, and aunts and uncles always talking about how much they loved Borscht. As a child, I had to disagree. They couldn’t be talking about that deep-red vegetable soup that I sat at the table and stared at, hoping it would somehow disappear so I could go play, could they? I’d like to believe I wasn’t too keen on Borscht because of the not-so-wonderful sounding name, though no doubt my palatte has simply changed. I get what my family was talking about. Now I make this soup all of the time. Take one look at that beautiful color, and then a spoonful of those lovely vegetables and comforting broth, and you’ll see why. Beets– probably the most vibrant vegetable around. I love their slightly-sweet flavor, and eat them both roasted and raw. 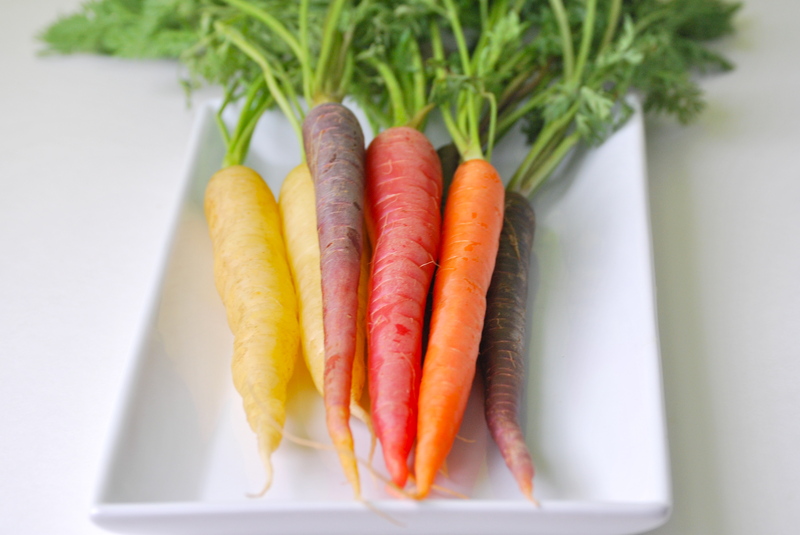 They are the foundation of this soup, along with a nice selection of other fresh vegetables. 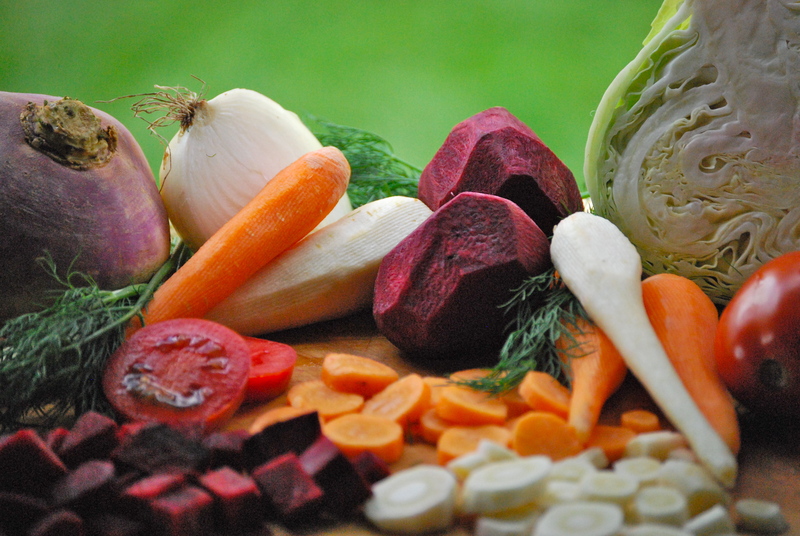 I like to add as wide a variety of vegetables as possible– in particular root vegetables– but if you don’t have exactly what I used, don’t worry. Like any good soup, this one is forgiving and you should be able to find a substitute. I used fresh tomatoes because I had them on hand. I also used the last of my homemade tomato juice. When I don’t have fresh tomatoes in winter, I rely on my homemade crushed canned tomatoes– about 2 cups. If you use canned crushed tomatoes, be sure to make the appropriate adjustments to the amount of liquid you add. In other words, you may not need as much water. Speaking of the broth, this is generally the only soup that I make using just water. In this soup the ingredients are so numerous and fresh that they provide that additional flavor that you generally get from vegetable broth. If you want a little more taste, you can add a ham shank or ham juice– like my Mother does. Both wonderful additions. 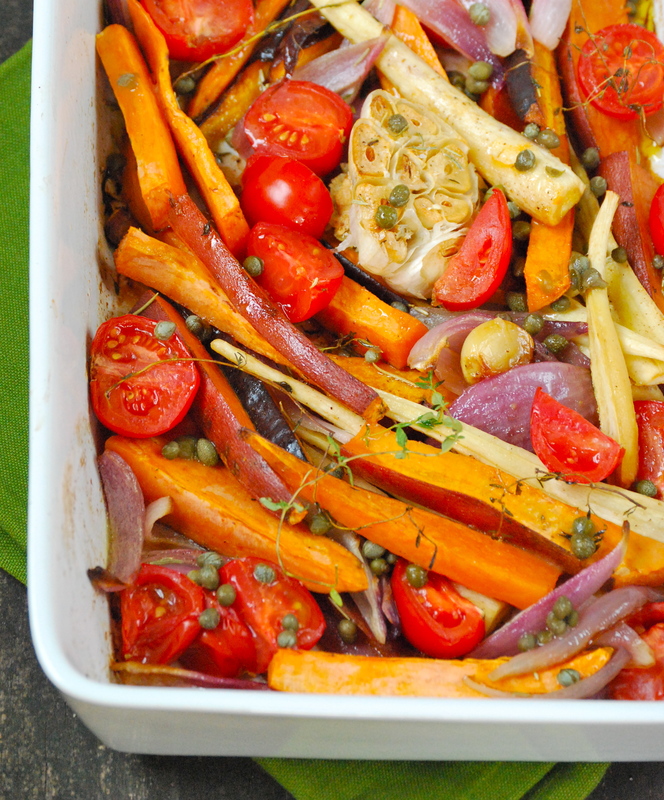 The two ingredients where you won’t want to vary from the recipe are the fresh dill and addition of vinegar. Both are keys to making this soup complete. 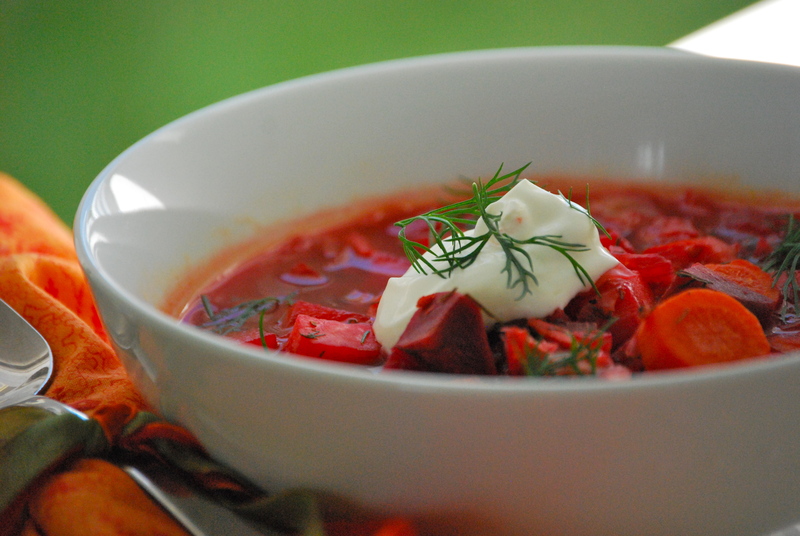 So how do you add fresh dill in early January when you want to linger over a bowl of Borscht? Thankfully, dill freezes very well. Stick it in a freezer storage bag and it’ll last for months. So why am I writing about a warm soup in late August? Good question. The last two weeks have seen crisp air at night here in Minnesota. I bought apples at the farmers’ market this weekend. And right now my house smells of cinnamon, as my husband is bottling a batch of his home-brewed Autumn Spice Ale. It has seemed like an unusually short summer– and though it going to be hard to let it go, I think I’m getting ready for Fall. This soup was a test and I think it feels right. 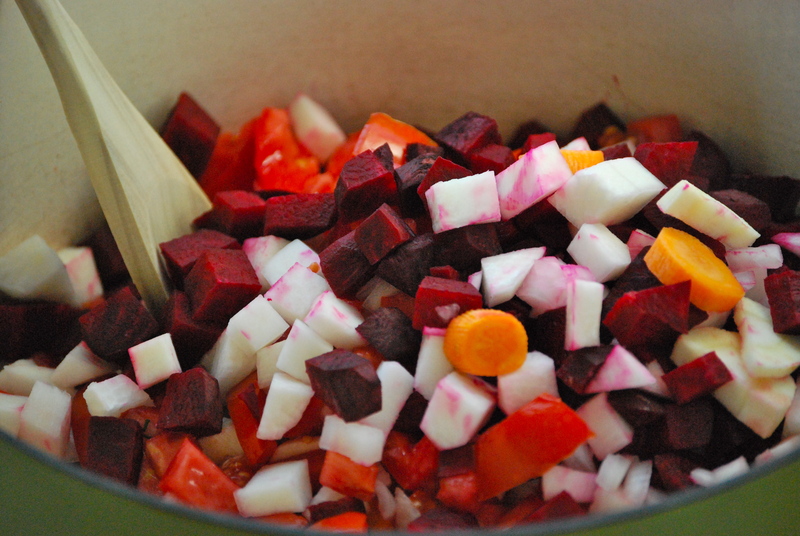 In a large heavy-bottomed kettle, such as a Dutch oven, heat the olive oil and add the onion, beets, carrots, parsnips, turnip, and tomatoes along with the kosher salt and black pepper. Saute until the vegetables start to soften, 10-12 minutes, stirring frequently. Add the cabbage and allow to wilt a bit, another 3-4 minutes. Add the water, tomato juice, bay leaf and vinegar. Bring to a boil and reduce heat to simmer. 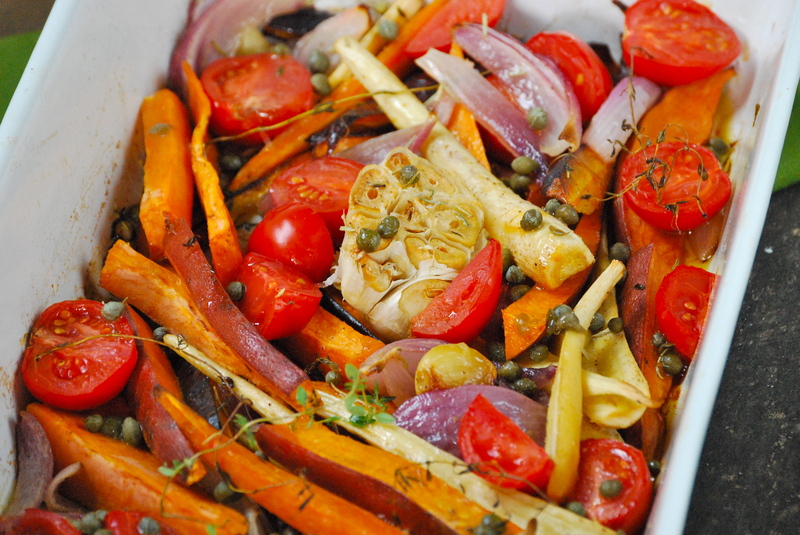 Allow to simmer until the vegetables are tender, 30-45 minutes, depending upon how high the heat is. Stir in the fresh dill. Make seasoning adjustments if necessary. Serve with a dollop of sour cream. Enjoy! Thanks again for stopping by Relishing It! Have a great day.